I recently acquired a 1983 Trek 613. It has an Atom rear hub with 6-speed Suntour freewheel. Rear spacing is 126. 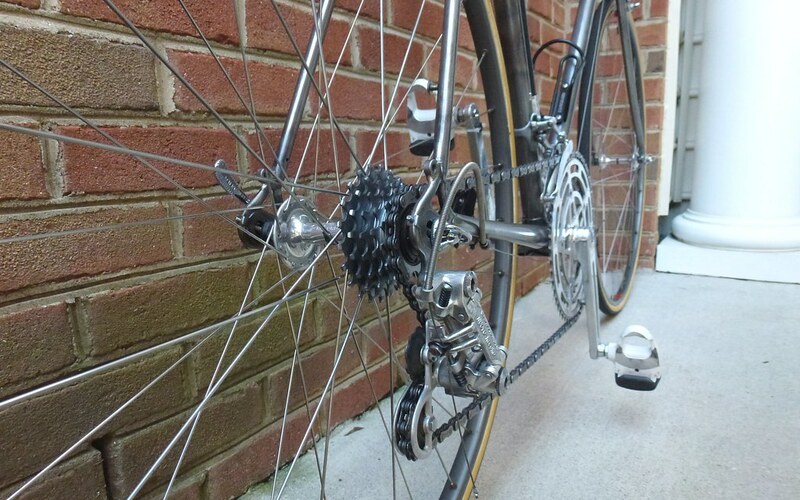 I am wanting to replace the freewheel with more desirable gearing. Would this hub be compatible with a Sachs freewheel?. What do I need to be concerned with on the freewheel with regard to compatibility with the Atom hub and what brands should be compatible? This could be either 6 or 7 speed. Any information and recommendations would be greatly appreciated. Thanks! A Sachs FW should thread right on. Your only concerns would be the usual like spacing and RD limits like max cog and chain wrap. Check the demensions you might be able to squeeze a 7spd in there. + 1. Any English threaded FW will screw right on. If going from 6 to 7, you might get some chain rub on the seat stay which can be fixed by adding a 1 mm spacer. You're wheel will then be a bit off center but it will not be noticeable. And of course you'll want to check the capacity on your rear derailleur so that it works with your new freewheel (or you might need a replacement rear derailleur to handle the bigger freewheel). Your rear derailleur might not be compatible with your freewheel approach to more desirable gearing. Look into that before you get a new freewheel. You might need both rd and fw or consider just a crankset. Virtually open each Pandora's box beforehand. My preferred method for getting "more desirable gearing" is to begin by using a gear calculator to play with different combinations of chainrings and sprockets until I arrive at the desired combination. Then I quest for exactly those chainrings and sprockets, and having acquired them, proceed to assemble the target crankset and freewheel/cassette combination. That said, there are a few pitfalls to be avoided when customizing drivetrains, freewheels, cassettes and cranksets, but the good news is the group here would love to help you acquire components for and assemble your ideal drivetrain while avoiding such pitfalls. So my suggestion is firstly to use a gear calculator to figure out what gearing you think you want, then consult with the group to figure out how to get it. Full details including decent photographs of your current drivetrain will be needed in due course, in order to help you find an efficient migration path from where you are now to where you want to be. Thank you very much for your response and all the others as well. My "more desirable rear gearing" is tighter, not more spread out. No need for a gear calculator. I live near the coast and only ride on small rear rings. Let me simplify. Trek 613 currently has original equipment Suntour BL shifters and rear derailleur with a 6-speed 14-26 freewheel (Suntour, I think). Intend to replace with Suntour Cyclone rear derailleur, Suntour Cyclone clamp mounted DT shifters, and Sugino Mighty Drillum crankset just purchased. Intending to run 7-speed with a Sachs 12-18 or 12-19 freewheel on the Atom hub. As a fallback alternative to the Cyclone shifters, I also have an NOS set of clamp on DT Simplex shifters which have no equal in functionality and will handle anything from 7 to 10 speed. One question is whether the Cyclone shifters will handle the 7 speeds, as they are early generation 6-speed, but I would imagine they should be able to handle the cable pull. Just wasn't sure about the freewheel compatibility because I have never had Atom hubs before. I would appreciate any additional comments or information, particularly related to any red flags that may exist in this setup. Thanks again for all the feedback! Last edited by cpsqlrwn; 01-17-19 at 07:10 AM. I run cyclones with 7 speeds. There is a very, very, very small chance the Atom hub and Suntour freewheel are French Threaded. If the Suntour is a Perfect or ProCompe model, look for the word "METRIC" stamped into the outside of the inner body between the two removal notches. If you are looking to move from the 6 speed Suntour to a 7 speed Sachs, there will be a difference in total stack height and depending on your hub and its spacers, it will either fit or not fit. 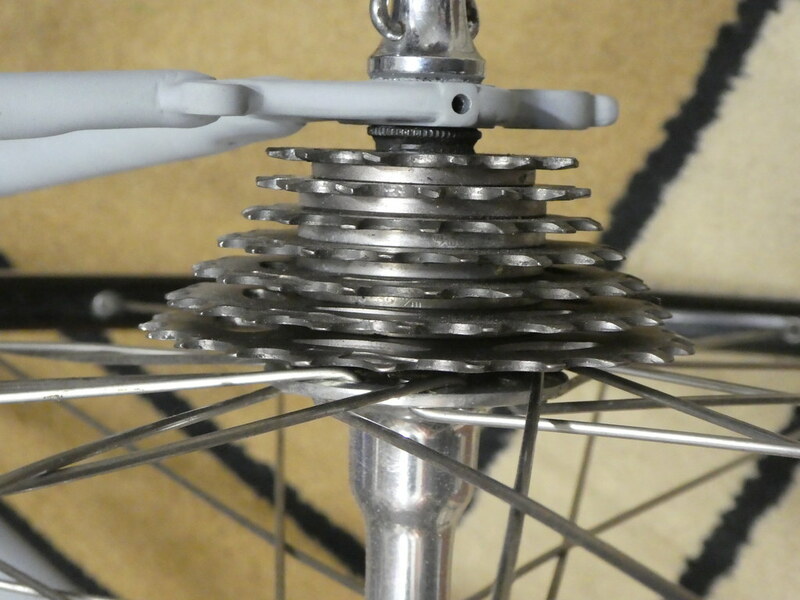 I've run into this when changing wheels spaced at 126 but a 7 speed that works on one does not always fit on another. If you want to measure your Suntour and compare to a Sachs Aris 7 speed height I can help you with the comparison. 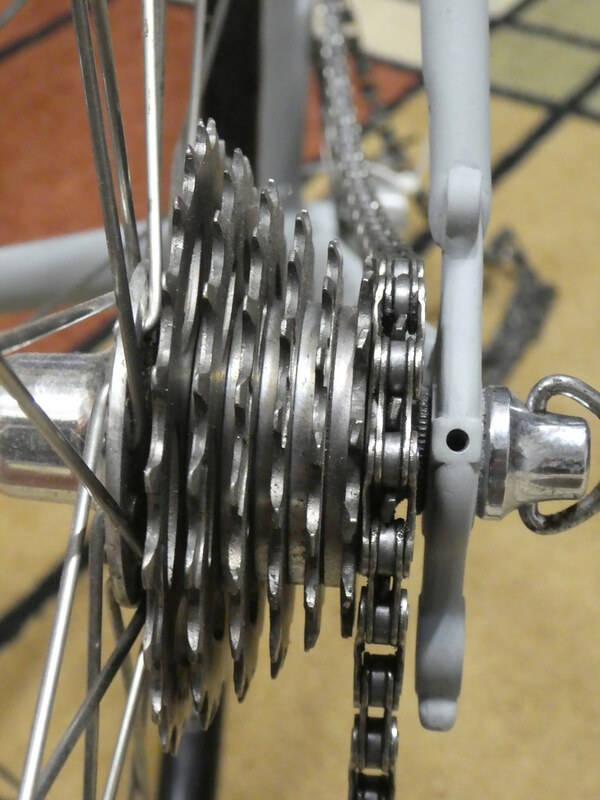 Look closely at how much clearance you have between the smallest sprocket and the inside of the dropout. I can also probably help you with 12-18 or 12-19 Sachs at a reasonable price. Last edited by SJX426; 01-17-19 at 06:38 AM. I've used a variety of different freewheels on my 1984 Trek 610, Sachsen, Suntours, and several different Shimanos, even some Regina.. 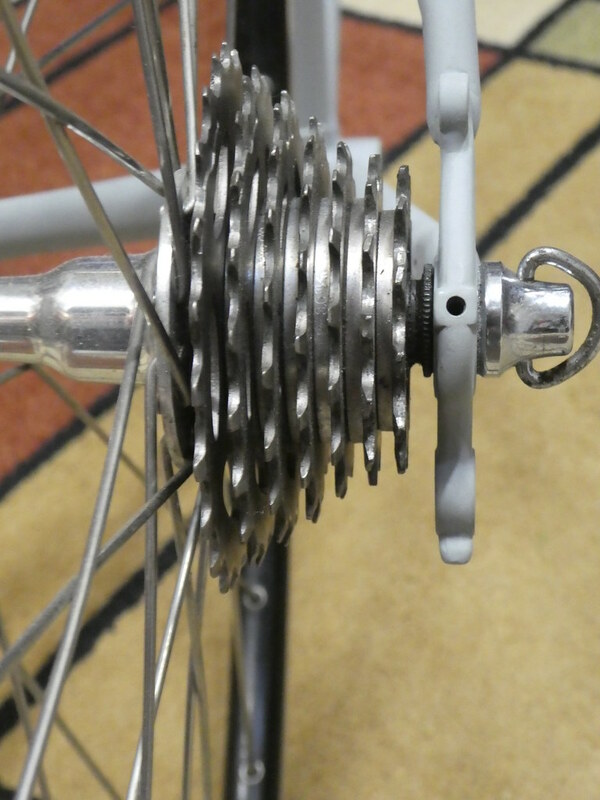 The hub was a Shimano 600 6207 made for freewheels, not for cassettes. The spacers on the hub axle are the same ones the wheel came with. There seem to have been several different spacing schemes on 6 and 7-speed freewheels - on occasion I would find a 7 that interfered with the inner face of the dropout. I usually just went to a different freewheel in that case. The best-shifting models have been the Shimanos and the Sachsen, possible edge to the Sachsen. At the bottom were the Reginas, with Suntour providing a small improvement. Currently I have a 13-34 Shimano Megarange on it, and it works very well with a Duopar and 53/39 in the front. I'm looking for a very low-Q compact for that bike. What I have now is a first-generation Chorus 53/39, and it has very low Q with the recommended Campy 111 mm BB cartridge. That is a really beautiful crankset. Thanks for the great comments and the photos are great I have the Sachs freewheels on the shelf. I have always preferred them because of the tooth etchings at the top edges that really seem to assist in chain movement onto each cog. I have always run them with Campy in the past. I am not familiar with any of the Shimano freewheels, but I would be very interested in knowing which ones are best, if they compare favorably with the Sachs, and if they would be a better approach to this spacing issue if the Sachs does not work out. Would the Shimano actually make more sense and provide some advantages over the Sachs? Are they smooth shifting? My hub is not helicomatic. I wouldn't have bought the bike if it were. I've read enough about them to avoid them. Looking at the catalog, it looks like you are reading from the 620 specs. The 600 doesn't show those hubs, just a standard single flange, quick release. Those early 80's Trek catalogs can be confusing if you are scrolling on a computer screen. The spec portion of each page has a diagonal margin and it is easy to read the one below the bike picture as the bike's specs. But the specs for each model are actually above the picture of each bike. Thanks for your post. Thank you very much for your response and all the others as well. My "more desirable rear gearing" is tighter, not more spread out. No need for a gear calculator... Thanks again for all the feedback! I lived in the mountains in western Virginia for about 10 years and I made extensive use of Sheldon Brown's gear calculator to figure out the best configurations for dealing with some fairly steep climbs in the Shenandoah. Now I live near the coast. The only time I use the crank small ring is to relax the chain when I hang my bike and to loosen up for 5 to 10 minutes before I start my ride. Where I currently live is rather flat with some moderate hills and hardly anything that is very steep. I rarely if ever use anything other than the large crank ring and the 3 smallest cogs on the back. If I am climbing a hill and I need to shift down, the next largest cog is always comfortable after not being able to sustain the higher cog. To me that is the definition of a properly geared bike. In addition, the gear inches on my smallest ring (12 teeth) with a 52 ring up front is 117.0. Using your example of a 44-42, I would not even reach your highest gear inches of 96.6 until I have shifted down to the 4th cog (15 teeth) on my Sachs 12-19 while on the 52 ring up front. That would be totally unusable for me. Hope this helps. Thank you for posting. Last edited by cpsqlrwn; 01-17-19 at 03:55 PM.